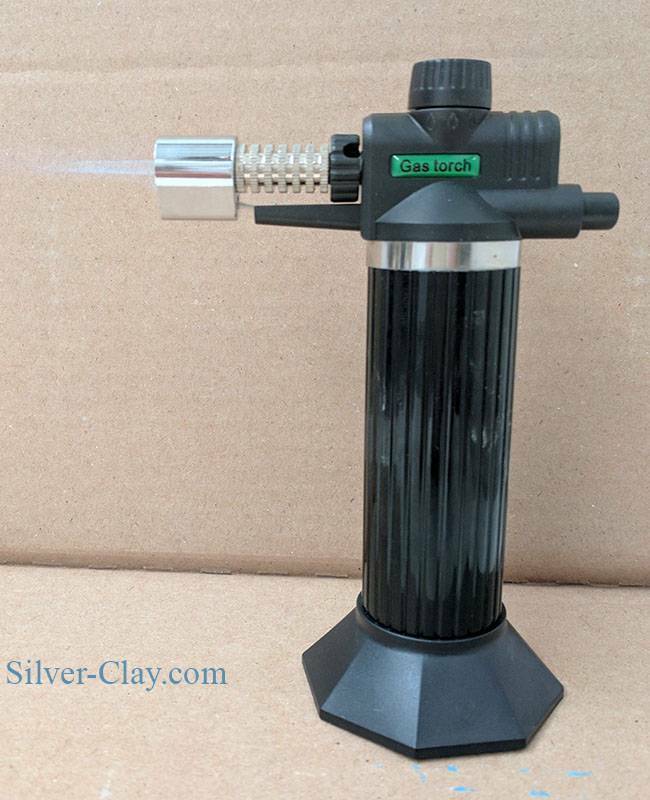 Micro Torch, cheap but works great for firing PMC3 and Art Clay! Does not include butane, available anywhere tobacco is sold! Allow the work to dry overnight or drive off moisture with a hairdryer, coffee warmer or in a slow oven. Torch firing is not recommended for large items. Place the work on a soldering block or fire brick, which is in turn set on either a fireproof surface or something that can be singed (like a piece of plywood). If you are working on the kitchen counter and the piece rolls off the block you don't want to scar the countertop. Light the torch and hold it so the flame is nearly vertical with the tip of the cone about 3/4" away from the work. Within a minute the piece will be enveloped in a soft flame as the binder burns away. The flame will soon go out by itself. Within another minute the piece will start to glow red. Continue heating until this becomes a bright and luminous color. At this point, glance at a clock. Hold this color as uniformly as possible for at least 5 minutes (10 minutes will produce a denser result) glancing away periodically to relieve your eyes. When the time is up, turn off the torch and allow the piece to cool at least until the red color is gone, at which point it can be quenched.